Chicago born and raised actor Lusia Strus, who currently stars in the TNT series “Good Behavior,” recently came back to her hometown of Chicago to see the last performance of “Too Much Light Makes The Baby Go Blind”, the groundbreaking theater experience that billed itself as Chicago’s longest running show. Strus, who was a Neo-Futurists ensemble member for 7 years, contacted The Chicago Ambassador to talk about her experience performing Too Much Light and her opinion of Greg Allen’ s decision not to renew the rights of the show he founded. 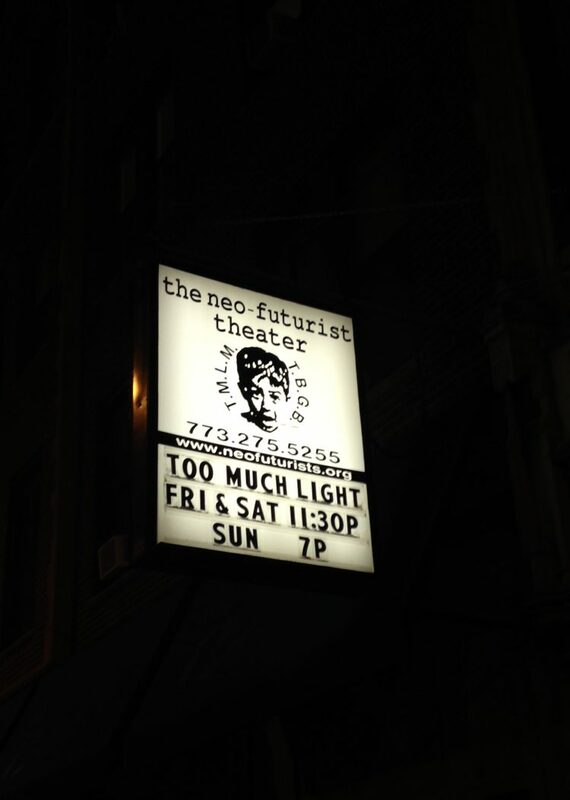 The late-night show, performed for 28-years in the NeoFuturist’s theater space in Andersonville, featured 30 plays in 60 minutes (with new material each week) and although each play was written by ensemble members, Allen owned the rights to the show and continues to even after he left the company four years ago in a well-publicized spat. In November, Allen sent out a press release that many Neo-Futurist supporters took as a shot to the current company that said he was going to let the license lapse in Chicago in order to put together his own “new diverse company” and reopen Too Much Light with a “specifically socially activist mission” “to combat the tyranny of censorship and oppression.” He also plans to bring Too Much Light to communities in Chicago where it has never played. Although Allen did not let the license lapse for the Neo-Futurists’ New York and San Francisco companies, (both have been performing the show for several years); in a show of solidarity with the company that started it, both New York and San Francisco have decided not to perform Too Much Light as well. The Chicago Ambassador’s Bob Chiarito recently interviewed Lusia Strus about her time as a Neo-Futurist ensemble member and her thoughts about Too Much Light ending. Lusia Strus on the set of Good Behavior. CA) You recently came back to Chicago to see the last performance of Too Much Light Makes The Baby Go Blind on December 31st? STRUS) Yes, and then I performed at the benefit that they had on New Year’s Day with 27 other Neo-Futurists from days gone by. CA) Were many who performed there when you were in it? STRUS) Oh yeah. Definitely Diana Slickman and David Tedeschi were there. When I was cast we would do the show 50 weeks a year. It was an ensemble of about 7 people and we did the show the entire year. Now they will do a run for two or three months and then they will take some time off to do another show. Then we just did it the entire year and took two weeks off around the holidays. The NeoFuturist’s performing Too Much Light Makes The Baby Go Blind in December. CA) How would you say performing with the Neo-Futurists informed your acting? STRUS) It built me. It creates an immediacy for me and helped me write. It made me very aware of words and how valuable words are. I try to look to whatever the writer has written before anything else when I’m working. I just finished a play at Playwrights Horizons in New York and realized that during that process that there was a lot of Neo-Futurism influence, because the character lent herself to it. There was no suspension of disbelief for her and that’s Neo-Futurism. And another factor for me is that the TV show I’m on right now — Good Behavior — Chad Hodge who created that show was a freshman at Northwestern and would come to see Too Much Light all the time. When he was a freshman in college I was cast so he’d come to the show and hope the tall blonde girl was in it. And four or five years ago I was doing a play at Steppenwolf and he was there and saw it. He wrote me a note on Facebook and told me that he had been following my stage career for years. I didn’t know he was a writer, but that week in particular I really needed a nice letter so I wrote him back and we struck up a friendship. Then he asked me to audition for Good Behavior, so it’s kind of a full-circle thing that is all because of Too Much Light. CA) When did you find out that it was going to end? STRUS) I found out when everyone else found out, when that press release was sent out. CA) What do you think about Greg Allen’s decision to not renew the rights? STRUS) I called him almost immediately and was profoundly sad and wanted a recount. I felt like I was 23 or 24 again and sort of didn’t believe it could happen. I guess the whole thing turned out beautifully because everybody rallied. Neo-Futurism, the company is surviving. Too Much Light Ended. CA) But the New York and San Francisco company’s will still be performing it, won’t they? STRUS) No, they gave up their rights to it, which I think surprised Greg. So it has ceased. Greg may do it in this other way where it’s strictly political and basically a brand new thing. CA) He was quoted in news articles talking about rebooting the company for political action with a new ensemble. What are your thoughts on that? Does he not trust the actors that are currently there? STRUS) That was something that I wish he hadn’t done and I told him that. I’m not telling you anything that I didn’t tell him. I think there was a knee-jerk response in sending that press release out and I felt like it belied me of Futurism because I don’t think it was honest. What I told him was that it insulted the current ensemble and the history of the ensemble members who were in it for the last 28 years. For me, and I think for the audience, the idea of Too Much Light is that it is this frenetic experience where these different voices, because we write the plays individually — all these different experiences, 30 different experiences are thrown at you randomly in this very fast, almost violent order. There is a movement piece, there is a very personal monologue, there is something musically oriented, something political, so that these images and pieces get through to you. Right after this dance piece that made you feel joy you and while your mouth is open in wonder you’re shoved in the mouth some political truth. That’s Neo-Futurism to me. For me it was very personal because I did write a lot about my personal life. When I was younger I wasn’t as politically orientated as I am now. It was the politics of my mind struggling with body image and addiction so that’s what I wrote about. I wrote about being an immigrant’s kid. That is what what audience members identified with and related to and to this day I get emails and Facebook messages from people saw plays that meant something to them. CA) Do you think there is there any chance that it will come back? STRUS) Possibly with Greg at the helm of it. But the Neo-Futurists are creating a new late night show which I’m sure which will be just as appealing. The important thing about what happens in that theater in Andersonville, and this is something that I always loved, is that young people come to that space. Young people come to theater, some for the first time and on their own. It isn’t their parents forcing them to come to theater or because of a school trip. They really come and they love it and they pay for their tickets which are very affordable. 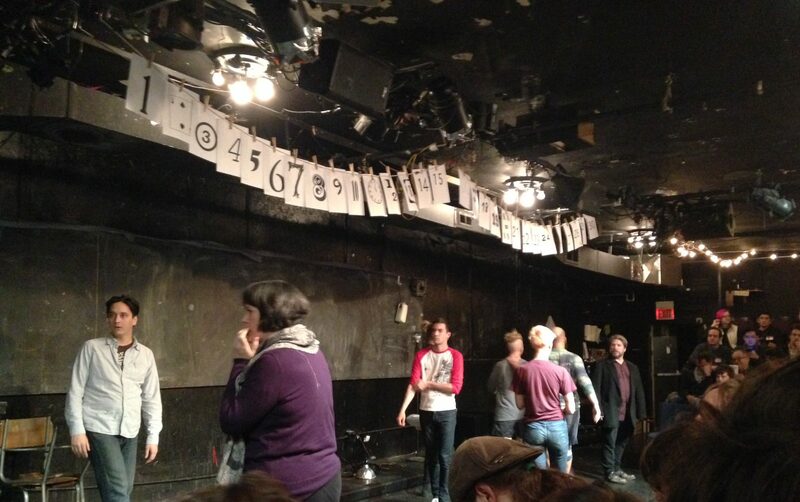 The Neo-Futurists have made theater accessible and affordable and have created an environment of young people. The sign outside the theater before Too Much Light ended its 28-year run. CA) Even though it was eventually also performed in New York and San Francisco, it always seemed a uniquely Chicago thing. STRUS) Yes, but the New York ensemble was pretty incredible too and it had been running there for more than a decade, so it’s strong in New York. CA) Will the New York and San Francisco companies be doing the same show as whatever they come up with in Chicago? STRUS) Possibly, they are all talking about it now. CA) What really stands out in your mind about Too Much Light or the Neo-Futurists in general? STRUS) When you join that company, it meant for more than the next decade we lived, breathed, ate, fought, cried and married each other. We wrote, we critiqued each other really honestly. I rebuilt my life in that theater. I think a lot of ensemble members do that, we become our own people in that theater and subsequently its all documented on that stage. And that’s the intriguing thing about that experience. CA) It will be interesting to see what they come up with.